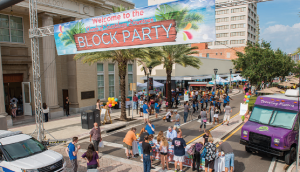 CLEARWATER, FLORIDA, USA, October 25, 2018 /EINPresswire.com/ -- On Saturday November 17th the Church of Scientology invites the community to celebrate the centennial of the Clearwater Building with a Downtown Block Party. Family, friends and neighbors are welcome to celebrate with local non–profits along with the non-profits sponsored by the Church of Scientology. The event will take place on Cleveland Street between Fort Harrison Avenue and Garden Avenue. The event starts at 4pm and all are welcome. There is no cost to attend. Family friendly 1920s attire is encouraged.